It is news across the nation that Texas has received so much rain that parts of our great state are now out of the years-long drought we have been experiencing. Our tank, which has been dry for the last 4 years, is overflowing and trees which have been thirsty for rain water during the drought are being uprooted and falling because they have been sitting in water for too long. The whole state is due more rain this week, and the word that ranchers and homeowners fear more than "Drought" is now going to become a reality ... "Flooding". The Blanco River in Central Texas crested at 43 feet, a rise of over 31 feet since late Saturday night. That 31-foot surge in the river level included a rise of 17 feet in just 30 minutes! It has resulted in massive flooding and loss of life ... entire families were swept away and the number of missing is rising. There are not words to describe the heartbreak we are experiencing in Texas. 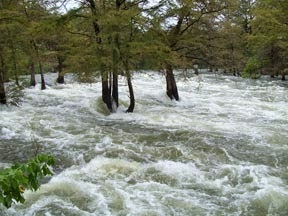 Yesterday, our capital city, Austin, experienced rain and floods that rival the historic Memorial Day Flood of 1981. Having experienced that one, I watched the new coverage of flooded streets and heard the reports from family and friends, and it was like I was reliving a nightmare. Also, the Federal Emergency Management Agency (FEMA) began notifying homeowners in the small southeast Texas town of Cuero that the Guadalupe River is expected to rise to over 40 feet by Thursday morning. The flood stage is set at 24 feet, with moderate flooding at 33 feet, so you can imagine the devastation that is expected in the next 48-72 hours. We have friends and family that live in Cuero, so this situation is also personal for me. The Red Cross is already implementing shelter in the school gymnasium for those who will be impacted by the flood waters, and people are voluntarily evacuating their homes. It is times like this that you hope the community comes together to serve each other and lighten the burdens of fellow human beings. A good friend told me that that is what happened during the "flood of 1998", which was the previous milestone for the town of Cuero. At the time, the citizens had no warning and little time to get themselves and their belongings to safety. But what a difference 17 years makes. Now with technology, people began receiving messages on their phones, directly from FEMA, of what was coming, and giving them at least 48 hours to pack up and move to higher ground. Red Cross and community volunteers were pre-warned, so the organization to provide shelter should be better coordinated and implemented. People flocked to the local grocery store for food, water, bug spray and batteries. Valuables are being relocated and decisions being made as to what is important to save, should the worst happen. It is at this time that priorities become crystal clear in your mind... all the material "things" that we humans collect and covet are suddenly unimportant. The only things you really need are a method to protect yourself and your family, important papers to prove ownership of your property, a few photos to maintain your ties to the past, enough clothes and food to sustain a few days or a couple of weeks until you can start the cleanup, and your Bible to give you hope. Everything else is replaceable. The last time that Cuero, Texas flooded martial law and curfews were invoked due to the unexpected flooding and the chaos that comes with devastation. It will be interesting to see if that measure is needed across Texas, as more and more towns are affected by the raging flood waters that are rolling downstream. If deemed necessary, how will it be instituted and received, given the difference in today's political climate? Will the diverse races come together in mutual support, or will the turmoil (both real and perceived) that is fueled by the internet serve to separate and divide communities? Now, more than ever, is the time for all of us to see beyond the color of our skin, and become the family of man. It is hard for me to reconcile that Evil would take advantage of such a miserable situation, yet that is exactly the vulnerability that comes with such catastrophes. No one is sure exactly how much damage to expect in the coming days, but right now the sky is clear and the rain has stopped. Please pray with me for the deliverance of Texas from the destructive flood waters and any social upheaval that the Enemy perpetuates. Let's pray that the stories coming out of this situation will glorify our Lord and restore the concept of "neighbor", as our state pulls together for the betterment of all. Psalm 29:10-11 "The Lord sits enthroned over the flood; the Lord sits enthroned as king forever. May the Lord give strength to his people! May the Lord bless his people with peace!" I have been praying for you my dear friend that God will protect you, your family, home and belongings and especially your spirit in these hard times and those in this world that are going through some very terrible times. I am also praying as you said that people will work together than against each other. Stay strong. Praying for my friends and family in Texas! Be safe!